If anything can be said of the Noughties, it is that the new millennium brought with it a multitude of TV talent shows right across the globe. From American Idol to the X Factor and Britain/America/pick-a-country’s Got Talent, television audiences are being swamped in tragic back stories and (hopefully) good vocals. Or whatever it is that the talent show in question is on the prowl for. Nobody knows this better than Catherine Bruton herself, who is self-admittedly a TV talent show junkie (check the acknowledgements!). Having read Bruton’s first (and standout) novel, We Can Be Heroes, I’m beginning to know her style. 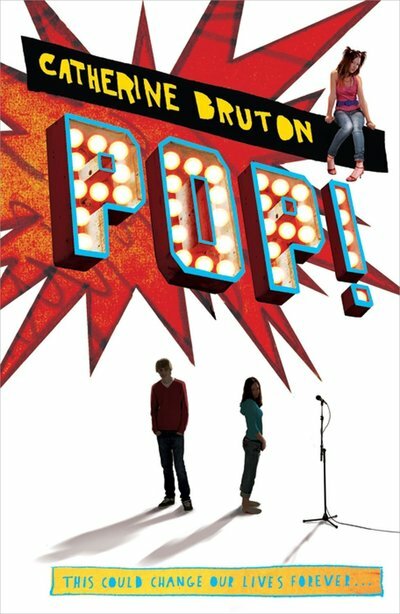 Without meaning to sound patronising or derogatory, Pop!, just like We Can Be Heroes, is a fantastic feel-good read where relationships are mended, situations used for good and Everything Is Alright. Or, At Least, Better Than It Was. Which isn’t a bad thing: to often, we get bogged down in dysfunctional endings and conclusions to series, it’s rather nice to read a novel where everything (or mostly everything) is an improvement on what it started out as. And let me tell you: there are some pretty broken situations in Pop! just like there are in We Can Be Heroes. Elfie, for all intents and purposes, is our protagonist; and though she is supported by both Jimmy and Agnes, there’s no denying that Pop! inexplicably revolves around her. And what a character! Quite literally, a character- she’s ambitious, slightly crazy and yet also in need of a little loving as she cares for her baby brother because her mother is rather incompetent. Like any good character, however, Bruton doesn’t shy away from showing Elfie’s more characteristically pushy and jealous side: a side that can create a barrier between herself and her friends and career out of control. Jimmy and Agnes are also excellent secondary characters with more than enough of their own problems. The innocent, small little romance they share is rather sweet and doesn’t feel forced in the slightest, possibly ranking as one of my favourite romances of this year due to its quiet and understated nature. I was surprised by Bruton’s decision to tell Pop! in a three-way narrative: particularly to begin with when there was considerable chopping and changing between them. I’m still not convinced that three point of views were the best way of telling Pop! : Elfie’s are, I feel, rather redundant as we already get a good feel for her character from the other two and I found it far more interesting uncovering the social dynamics between the three from the two shyer, quieter characters, Jimmy and Agnes due to their more enigmatic personalities. Of course, this wouldn’t be a Bruton novel if it didn’t tackle some serious issues, and Pop! takes on the issue of strikers in a way that is reminiscent of the Eighties (or at least, I like to think so, having not been around then!) miners’ strikes across Northern England in what seems to be a very true-to-life way. Bruton may not be a household name, but she certainly deserves to be and I can see Pop! entertaining a wide range of readers: from seven to seventy-seven, there is something about Pop! for everyone, if you give it a chance. I never expected myself to be a fan of novels such as this, but I can safely say that Bruton has got me hooked and I’m already looking forward to her next book. What did you think about Pop! ?